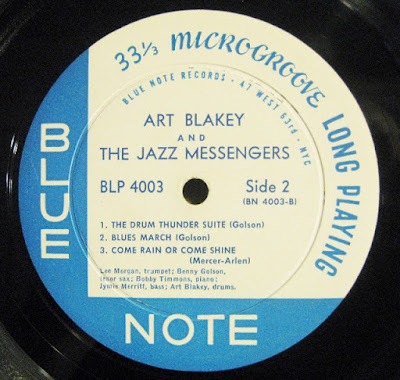 As I was browsing through the jazz section at my local record shop, I ran across this pictured copy of the self titled Blue Note LP Art Blakey and the Jazz Messengers, also known as Moanin'. It's nicknamed this due to pianist Bobby Timmons, and his composition of the same name. The price tag that was affixed to the plastic cover sleeve was $29.99. I thought, probably a Liberty Records pressing? So I took the vinyl out from the sleeve to inspect, I glanced at the label, it read 47 west 63rd NYC. I can see the deep groove in the labels, it's a mono copy. I inspect the Blue Note logo, no trademark R under the E in Blue Note, and the RVG and the Plastylite cursive P are in the dead wax run off area. Blue Note 4003 Available Now. The vinyl condition is stupendous, not mint, but a strong VG+ with light marks and scuffs. The vinyl still has quite a bit of luster and the labels have very light spindle marks, This copy probably would easily bring $300-$500, maybe more. The cover is not bad either, no splits, strong intact spine, but certainly no better than the very good (VG) grade, but over all a nice playable copy. I eventually sold this to an overseas buyer for $400.00. In hindsight, I probably let it go a little too cheaply, as he nabbed it up within a few days of the listing being posted. Considering how well it played, I am sure he was more than happy with it. Even with it being a mid level condition record, I bet the one who bought it from me will turn it around and make a nice little profit, if they haven't already. To find this record in this type of playing shape for 30 dollars is just incredible to me, every Blue Note collector strives to find an original first press copy of classics like this. Trying to get the best possible sound, and as close to the original source as possible is the key. Hearing a record like this for a true Jazz nut, can be almost a religious experience, it was for me. It's not really the sound quality so much, but rather the feel of the vinyl and jacket card board, you just don't get that from a CD or download. The music quality of original vinyl might be tad oversold, especially when I have a new 45 rpm double LP that to my ear sound just as good. But If I had the cash, I would very much dig deep into the original vinyl. I couldn't help but wonder why this usually high priced shop would have $30 on this record? My only guess is, they tend to specialize in rock music and new independent vinyl issues, and it just slipped through the cracks. Maybe next time I will run into an original Hank Mobley Soul Station LP. You never know what might be in those crates? What are Blue Note 4003 and others selling for at the moment? A copy of Moanin' back in November 2012 sold for $1,125 on eBay reportedly in Mint Minus condition, the cover was much cleaner too than my pictured find. My find is definitely not a top copy, but still a solid play copy. My copy was not close to mint, but it was VG+ and played with very light surface noise and sounded so present and full of life. I have a collection of well over 300 Blue Notes, but only 30 are original first pressings, and this was by far the best condition vinyl of those. Most are in the VG- to VG condition. You must remember you are dealing with prices that most can barely dream of, with originals fetching between $2,000 and $5,000 all the time on eBay. I've been fortunate to find an original first press of Horace Silver's Horace-Scope in VG condition, played very well, I paid a lousy dollar for that at a thrift store. I also found a Freddie Redd Connection with Jackie McLean first press for 2 dollars at a yard sale, that record had a few deep marks and heavy scuffs, but also played surprisingly well. The point is, you can get lucky if you dig. 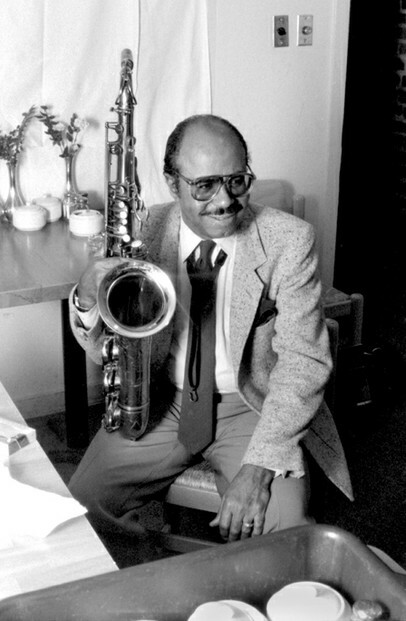 "Along Came Betty", "Are You Real", & "Blues March" were tenor saxophonist Benny Golson's compositions, and he is the real star on this Jazz Messengers classic. Golson was responsible for 4 of the 6 compositions, with "Are You Real" "Along Came Betty", and "Blues March", all becoming standards. Benny also provides an extremely tasty tenor sax solo on the Bobby Timmons track Moanin'. Golson is one of the unsung heroes of jazz, even with his recent notoriety. His body of work speaks for its self, the number of standards and his arranging skills have influenced countless jazz musicians. Benny has composed televisions scores for shows like M*A*S*H and Mission Impossible, he also lead the Jazztet from 1959 to 1962, and then again in the 80's. It would be hard to argue that Moanin' isn't the greatest Jazz Messengers album, perhaps A Night in Tunisia or Free For All come close? When you run down the list, there are a lot of great albums to choose from. Very unusual to find a Blue Note LP period in a thrift store bin, but to find 4 of the same artist. With all being New York USA or earlier pressings, all a strong VG vinyl wise, with the House Party being Near Mint, it's simply astounding for .99 cents a piece. This type of find is rare to say the least, I began to think maybe this was the mother load I have been dreaming of for the better part of 10 years. Unfortunately the Smith's were it, I even asked 2 different people if more records were waiting in the back to be put out, one of these days I will strike the vinyl record lottery. What is Dead Wax, and What's in the Dead Wax? 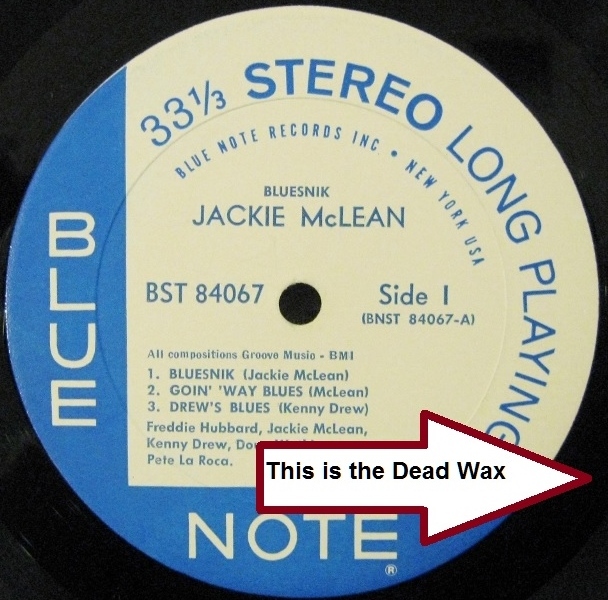 Dead Wax simply refers to the run off area between the grooves and the label. This area will have various marks and or numbers that you can look for to find what pressing it is. RVG in the Dead Wax: Rudy Van Gelder was the engineer on most of the Blue Note sessions of the 50's and 60's, his sessions are desirable. He also did hundreds of other records for the Impulse and Prestige label. RVG in the dead wax, hand etched or stamped, means it was mastered by Van Gelder, his sessions on vinyl are considered by many to be high quality. SEE PHOTOS. VANGELDER stamped in the dead wax is a later pressing. Sometimes, after 1960 STEREO is seen after the VANGELDER or RVG. The Ear in the dead wax, "or cursive P" refers to the hand etched ear shaped cursive P in the dead wax. Plastylite was the pressing company Blue Note used up to the Liberty buy out of 1966/1967. No liberty issues will have this Ear. Typically, records with the P mean a higher quality "heavier" pressing. Here is a photo of the EAR/Plastylite P as it rests in the dead wax run of area. 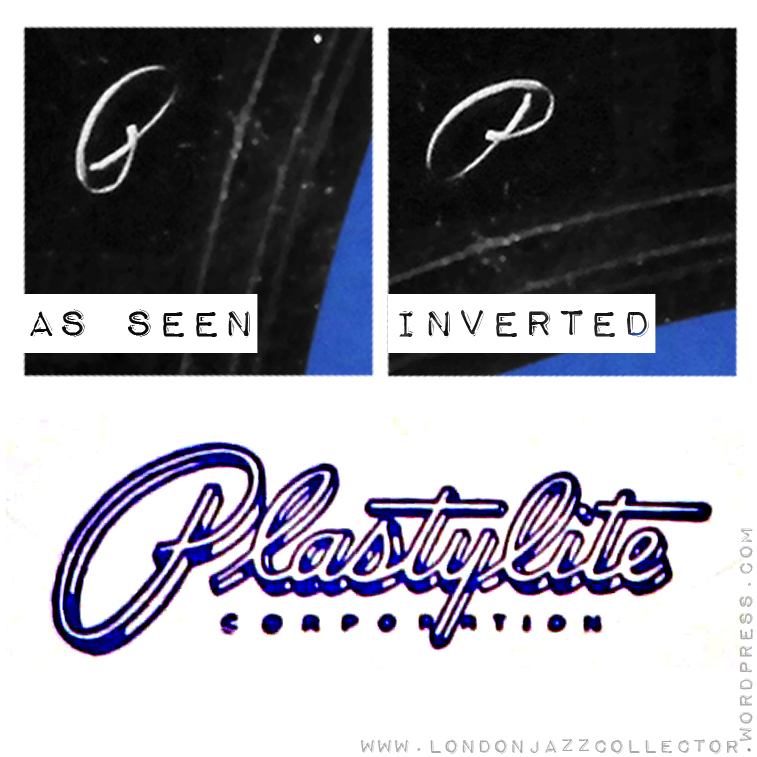 This Ear/Plastylite P is what collectors look for on a New York USA label, to guarantee it is not a Liberty label masquerading as a New York USA. With excess NY USA labels being used AFTER the Liberty buyout of Blue Note, the EAR is your own assurance it's a heavier vinyl New York USA Plastylite pressing. Note: linked Photos on this post are courtesy of LondonJazzCollector.com. The absolute best site anywhere in my opinion for a jazz vinyl aficionado. I highly suggest you check that site out if you're serious about vintage vinyl jazz, almost every label of note is discussed. Are you struggling to pick up on all of this Blue Note record label minutia? Believe me, I know how tough it is at the start of your journey trying to track this record label stuff down. Understanding what original and reissue really means was a daunting task. I have been a Blue Note jazz aficionado for nearly 20 years, I didn't catch the Blue Note vinyl collecting bug for better than 10 years into that journey. With auction prices reaching lofty heights, you better know what you're doing, both buying and selling, or you could lose your shirt. Below I will show you photos of labels from my collection, these will highlight the labels that serve as a guide for pressing identification. I had to learn this stuff or else risk getting burned buying and selling on eBay. I will also go over what terms like RVG in the dead wax mean, what the trademark R's importance is; also what the abbreviation (DG) means, and why it so overused on eBay listings. We can't forget that all important EAR in the dead wax either. Notice below labels had subtle changes throughout the early years, then drastic changes after Blue Note was Sold to Liberty. Pay attention to the addresses for the pre 1967 records, then it's more fuzzy as you go forward through the 1970's where the non traditional colors become the identifying feature. This is where it all starts, at least 12 inch LP Blue Note collecting anyway. Every single record released with the Lexington address is a mono copy, Blue Note did not release a stereo issue until 1959. Horace Silver's "Stylings of Silver" has the honor of being the first. These are generally all deep groove. 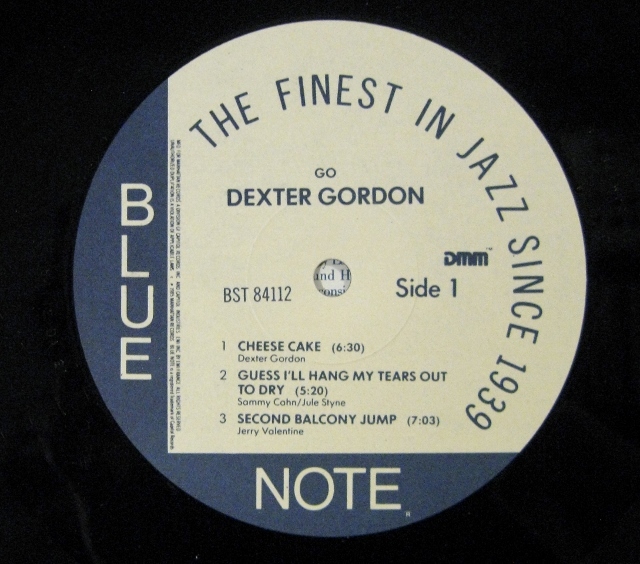 Also I would like to make the point that these original Lexington Blue Notes in VG+ to Near Mint Condition are commanding insanely high $1,000 plus prices. Jutta Hipp, Hank Mobley, and Lee Morgan vinyl are fetching well over $3,000. Don't be discouraged, I find lesser condition copies of these at thrift stores and record shops all the time, with multiple marks per side some times. The record is VG minus at best, but people will still pay 10% of Mint value if the cover is VG. Surface noise, ticks and pops can be lived with, but skips can not, a skipper might bring you 5% of Near Mint. You can't forget though, that it's all about supply and demand, and both of those factors fluctuate so much, you can see some wild price fluctuations. Sometimes when selling a lesser grade copy, it's just happenstance, someone stumbles by and sees a record that sells for $3,000 Near Mint, but can't resist the idea of having a Good to VG minus condition copy for $150. I sold this pictured copy for that much, I bet the buyer was thrilled. I didn't hear anything negative, they were probably so happy that they received a record that played better than the visual grade. That's the thing about the Lexington's, they hold up well to moderate marks and scuffs. I distinctly remember that deep bass sound, or at least the bottom end on these being very impressive. Surprisingly, these hold up well to moderate marks and scuffs. 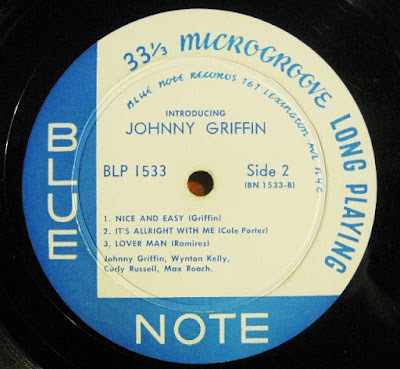 in fact, the photo of the Johnny Griffin label above is one such record I found that plays very well. I paid 5 dollars for it. All of the Lexington addressed Blue Notes are mono, and they do sound good, this particular label usually boasts very robust and detailed sound. With these thick Lexington LP's, they always seem to have a deep, well recorded bass, and everything seems closer to the microphone. Sometimes though, you run into a hiss sound, not the normal surface noise, a moderate distortion? I'm thinking this is groove wear. After so many spins the vinyl will degrade, I am sure that 50's era equipment was not as delicate as it became... So I can see why mint copies bring such extravagant prices. Note: Thanks to a kind gentleman for straightening me out about the"767" and not "161" on the Lexington Label. This particular Label has stereo and mono "microgroove" recordings, sometimes you will find these with the "Inc." after Blue Note Records up near the address. later on, the New York 23 was dropped and only the 47 West 63rd is left. The pictured record is a perfect example of the type of original Blue Note that won't destroy your budget. I picked this Jimmy Smith record up for 5 bucks at a local record shop, the vinyl playing surface was graded liberally at VG, a few marks that I could feel. The record still sounds way above average, I am truly amazed at quality of these, even in less than average condition. They are always worth a gamble, even if typically the condition makes you cringe a bit. Some staunch collectors are not huge fans of organ jazz, but I like it, and will not apologize for it. 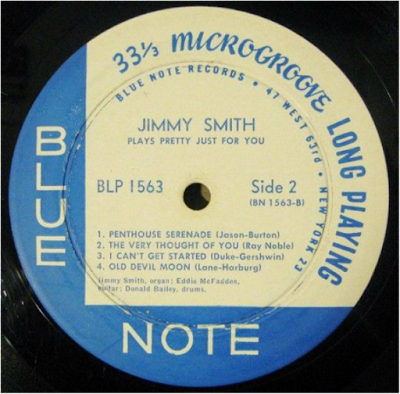 Here's another Jimmy Smith find, a trio of Blue Note's found at the local Goodwill thrift store. 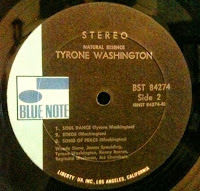 This particular label used from 1958 to 1962 also began the stereo era at Blue Note. This was the label where the trademark circled "R" started being used under the E in NOTE, any records that saw their original issue prior to 4018 with the R are not original. This Blakey LP pictured does not have the "R", therefore it is an original first press Blue Note. If one has the trade mark R before 4018, then it is not an original. The address reads Blue Note Records, if it reads Blue Note Records Inc. It would not be an original unless that record's first issue had the Inc. The New York USA label is the end of an era really, the end of this address marked the end of Plastylite pressed records. Alfred Lion's association with the label ended, and unfortunately after the 1966 Liberty buyout, the quality of the record cover art suffered as well. I have several 2nd press New York USA label Stereo's that match or surpass the original 47 West mono copies for what it's worth. The Jackie McLean Bluesnik, and even the Blakey Moanin' LP, I don't know what to make of this really? These will not have the Ear/P in the dead wax, so ask questions if you need a true NY USA copy, that Ear must be in the dead wax. This is where things get confused and really tricky, 1966 is where Alfred Lyon sold Blue Note to Liberty Records. This is also where Plastylite was dumped as the pressing company, and soon Reid Miles was no longer designing covers anymore. One of the confusing things, and I learned the hard way: Liberty at this point was still using NY USA Labels on their records which were not stamped by Plastylite, and the vinyl quality seems inferior to me as well on those if you compare. But please understand this quality I speak of, can be splitting hairs. I have learned during my 4o plus years, one mans trash is another man's treasure, so check for yourself. The quality difference is not nearly enough in my opinion to keep you from saving massive cash on Liberty issues. I ran across a few of The 3 Sounds LP's several years ago, they were NY USA Labels, but there was no Plastylite P/Ear in the dead wax. I had no idea about this Liberty using old NY USA labels stuff. Months later, after more research and comparisons, it was obvious the quality was inferior. In essence these were just Liberty Pressings Masquerading as NY USA copies. Now please understand that the sound difference wasn't so wide that I wanted to throw the record away, but the point is, I paid a premium for that record and it was not a real NY USA. The seller perhaps didn't know that the EAR's meaning meant such a difference. I would highly suggest if you're eBay shopping, and someone says "NY USA", ask about the Plastylight P, and make sure that RVG or VAN GELDER is somewhere in the dead wax. Then you know it's a real NY USA. Remember if they say its original, or say there's an EAR, and there isn't one, that's out right fraud. Unknowingly or knowingly, who knows? If they don't mention the details that make it what you want, don't assume, in the end you have to be the one to find out. This black label Liberty U.A. pressing might be the rarest of all Blue Note Labels, only used briefly after the year 1970, these usually sound pretty good too. I like these sound wise over the blue and white Liberty pressings, usually these will have the VAN GELDER stamp in the dead wax. At least two first pressings I know of with this label, McCoy Tyner's Expansions and Ornette Coleman's Love Call. I did do a cross comparison on Brother Jack McDuff's Moon Rappin', Tyrone Washington's Natural Essence, and Lee Morgan's Live at the Lighthouse: I could not tell any discernible difference in the sound between the Blue and White label pressing and this black label press. I recently tested a Lee Morgan Candy, and a John Coltrane Blue Train, I though the records sounded fantastic, with a crisp clarity. I didn't weigh these, but it seems these are heavier than some of the blue and while label Division of Liberty, perhaps they are? These United Artist's pressings seem to be much lesser quality material wise, the vinyl is thinner and they don't hold up well to surface marks. 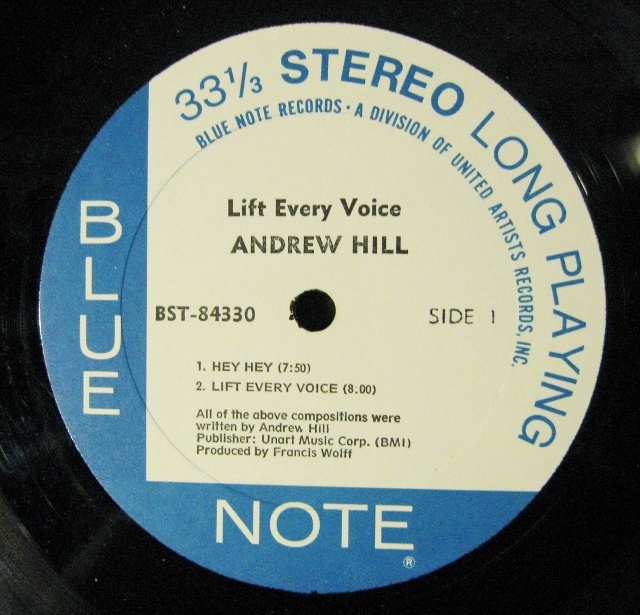 There are other variations of these Blue and White label ones too: Sometimes 1972 will be under the the Produced by note: Also, blue track and production notes instead of the black ink pictured above. Just know that this United Artist blue and white label is dated 1971-1975. The one perceivable thing that does stick out when testing the 70's as opposed to the 50's and early 60's presses is the depth of sound. I mentioned before, the full sound, the ability of the early labels to sound good even in VG or less condition. It's absolutely there, the oomph is missing in the overall clarity. Sometimes new "2000's" reissues sound better to me than these 70's issues. The black b pressings though sound better, and the vinyl thickness seems better, but it is common knowledge now that the weight of the vinyl doesn't necessarily equal great sound. The composition of the vinyl, its purity is what counts. 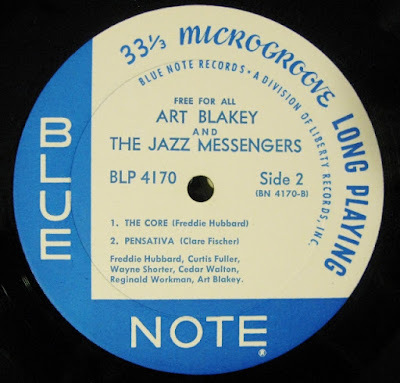 The "black b" Blue Note pressing is known as the poor man's deep groove Blue Note. It is a decent sounding record, PLUS the 70's era covers are still thick and have that vintage look and feel. This seems to be mainly a re-issue label, with the white b being new titles. These are rising fast in price now that the other pressings have shot beyond expensive prices. Most U.A. black b's can be had from $10-40 dollars, some titles though like Sam Rivers, Grachan Moncur III, and Jackie McLean can approach $100. Generally all releases are stereo, and VAN GELDER is stamped in the dead wax, these do offer underrated quality sound in my opinion. Many times I have compared these Mid 70's pressings to earlier pressings, while nothing beats the early 1951-1957 pressings for sound, these black b pressings are very good, and very reasonably priced. Perhaps the sound gap isn't as wide as many audiophiles say? This label was primarily used for the mid 70's 2-fer LP's, that featured many of the significant Blue Note artists and many unreleased sessions, out of print, or newly discovered sessions. These particular sets can be found at bargain prices, and quite honestly are a hell of steel, I don't think they sound terrible, though many aren't thrilled with them, I guess the best way to state it, they are a bit of a mixed bag. Producer Michael Cuscuna of Mosaic Records fame, compiled many of these double albums for release. Artists like Cecil Taylor, Booker Ervin, Jackie McLean, and Freddie Hubbard are featured prominently. Much of the music on these re-issues have also been remastered for a CD release, most times complete with brand new art work. Since a CD's running time 80 Minutes, many time most of the music can fit on one disc. I do believe in the case of the Andrew Hill 2 fer One For One, they squeezed out a CD re-issues Pax. and 6 track appear on The Mosaic Box #16. Hill's Change, came from the Sam Rivers Re-issue series release Involution as well. This label was used as new titles label for blue note from 75' to 79'. I also believe those 79-80 vault releases have this same white b, "you know the ones with the redesigned and ugly covers", that look nothing like the classic Reid Miles style covers? The original vinyl was housed in generic uniform design with an even more generic, often times completely unrelated photo on the cover. Who ever came up with the idea to jettison the original classic Blue Note style cover art should have been slapped silly. Some of the best of this reissue series were: Larry Young's Mother Ship, Andrew Hill's Dance With Death, and Bobby Hutcherson's Medina. These are also very reasonably priced, except the Andrew Hill Dance With Death, which can be a bit pricey due to Andrew Hill's popularity, and it being one of his best records period. These DMM or Direct Metal Mastering LP's from the mid 80's are widely considered to be the worst sounding Blue Note vinyl pressings. I don't think they are all that bad, but some I have, do seem to have a thinner sound than I like. This Dexter Gordon Go LP wasn't bad at all, better than the CD at least. Some, like the record pictured, sound pretty good. Usually you can find these dirt cheap, if your patient, these 80's pressing can be had for less than 10 bucks many times. If I see a DMM in a bargain bin under 10 dollars, I will always grab it up, these will probably be rising in price as well as the Lexington's thru NY USA are year by year becoming luxury items. The mere mortal collector like me has to settle for these lesser priced bargains, and if you don't have a completely ridiculous audiophile ear you can still enjoy records like these. You can find this same label without the DMM though, and I have heard that many people like these, I don't think I have heard any of the non DMM of this label type. The Scorpio label is a current reissue label that I can not find much info about, the weight of the vinyl is decent but I think under 180 gram. I have a few dozen of these, I picked up a bunch when an online store was going out of business, 5 bucks a piece was hard to pass up. The mastering quality is average at best, I had a copy of Wayne Shorter's Speak No Evil that sounded very good and seemed to have a little more punch on the bottom end. I now have a Liberty issue that does not sound better. These were pressed at a plant called Scorpio, but reading further, knowing the plant name, I was able to find that there have been complaints from audiophiles about the sound quality. Apparently these are nothing more than digital copies pressed to vinyl, like listening to a CD for the most part. As I mentioned above, for the price, as a filler copy, I wouldn't have a problem with it... but if you are a real sticker, I would pass on these. It would be a wiser decision to pay twice as much for a better quality reissue. King Japanese reissues. The 45 RPM Music Matters double vinyl I hear great reviews about, and I know the mid-90's Capitol EMI Connoisseur's series sound good to my ears. I do think these are pricey, but they will be in mint condition and should be free of surface noise. *Affiliate Disclosure: Any link or photo you click could take you to another site, if you buy a product on that site, I could earn a commission. I also may place links direct to my own eBay store. I am amazed how many sellers are just plain ignorant on what they are selling, sometimes that can be to your advantage of course. I cringe though, when I see a Blue Note record billed as an original or having a deep groove when it obviously does not. Check out what originals are selling for right now. If you have the financial ability to pay that kind of cash, you'd better know what you're doing. I'm concerned with out right misstatements, like saying a Liberty issue is deep groove, or saying a Blue Note 4003 with the trademark R is a first press, when only pressings without the R are true originals. Would one sound better than the other? I doubt it, unless you have some super-human hearing, but no R is rarer, and pressed earlier than the trademark R copy; and consequently brings higher prices... you don't want to pay non trademark R prices for a trademark R copy do you? That could be a few thousand dollars difference in price. Things like that, you have to watch out for. It's your money, be careful out there. Read on for more detailed tips compiled from my own experience. Remember: It is up to you to know what DG means, and what RVG and Ear means. These are ways to identify the year and authenticity of the pressing. Items that are obviously non deep groove records, are being touted as just that, deep groove. For the most part Blue Notes vinyl pressed after 1962 will not have the deep groove. Sometimes a second or third pressing might show up being pressed by the early stampers, and thus have a deep groove on one side and sometimes both. Many eBay sellers are listing New York USA and Division of Liberty label addressed Blue Notes as a deep groove or "DG" abbreviated, even when the photo clearly shows it is not a deep groove pressing. I have even seen new reissues with that DG abbreviation on the listing. I nearly smashed my fist through the screen when I ran across a Compact Disc Blue note listing with the DG, huh?. Bad enough when they clog up the search results using "mini LP" as a keyword as it is, but deep groove used for a CD is beyond ridiculous. 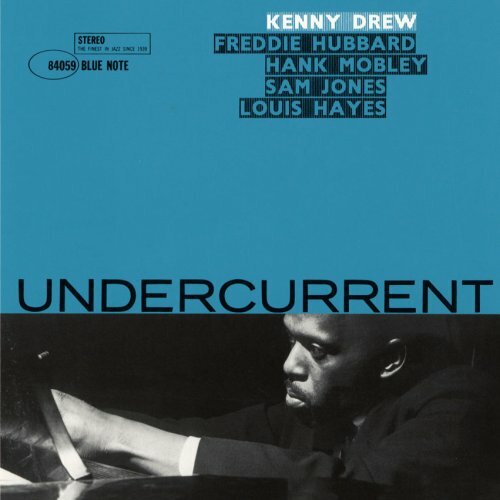 Kenny Drew's Undercurrent (4059) was the last original deep groove Blue Note, and usually only found with one side deep groove. This deep groove error on an eBay listing could mean hundreds of dollars difference in price, if not thousands to a novice with money burning a hole in their pocket. I have seen auctions go to extreme heights, when 2 newbies start bidding on a Liberty Blue Note with the deep groove description. Perhaps those buyers thought that it was a first press or something? I just don't see any other logical explanation outside of shill bidding. I see this happen a lot, where a 40 dollar record gets bid up to $200. I wonder how many people end up not paying at all on those? 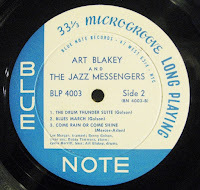 Almost every first press Blue Note Record pressed after 4059 was pressed by the new stampers, most records pressed before 4060 have a deep groove pressed into the label. This deep groove identifying feature has nothing to do with the vinyl playing surface its self, except that deep groove pressings are heavier vinyl and do normally sound better. To what degree, you really need to judge for yourself. If you have the coin, my complements. One time I noticed a late 60's Liberty pressing of Jackie McLean's Bout' Soul, it was listed as DG, this might not sound like much, but it is unbelievably inaccurate. Unfortunately this abbreviation has become a catch-all Blue Note phrase, many novice sellers don't even understand its meaning. The novice buyer just believes DG is good, some just think it means vintage, and so that means better sound. Just be careful out there. What Really is Deep Groove on Blue Note Vinyl? Which Blue Note records do have a deep groove? Original pressings on this label are not deep groove, some times you will find a second or third press with the deep groove, some times with just one label pressed by the original stamper. Sometimes, you can find a double deep groove NY USA copy. These NY USA that happen to have deep grooves, are usually reissues of earlier sessions. This where the minutia turns to manure in my opinion, I am a collector, but I began lose interest with this type of heavy lifting. To my knowledge, every record Blue Note made after Blue Note sold out to Liberty Records is not deep groove, and they quit using the pressing company Plastylite all together. Remember: If you run into a deep groove NY USA, it is typically not an original press of that title, yet still on the rare side, and might have some extra value to a completest collector. You're scanning the latest auctions, and you see a listing saying Blue Note LP NY USA. The unscrupulous, or more likely the ignorant sellers are banking on you not knowing that after Liberty Records bought out Blue Note around the year 1966, they quit using Plastylite as the stamping company. The new stampers just did not stamp the Ear, and this also seems to be the time a lesser quality vinyl started being used. If you pick up a 50's era Lexington addressed label LP, and compare it with a 1967 copy of Ornette Coleman's The Empty Foxhole for instance, you'll feel the difference in weight. You see, Liberty was still using old NY USA labels that were piled up probably all over the place, and placing them on the Liberty pressed vinyl. Who knows how long this went on, perhaps as late as 1969? NY USA copies were supposed to have been pressed from 1962-1966. Imagine paying top dollar for a copy of Tony Williams Spring, billed as a NY USA first pressing, and then finding out that it was a Liberty stamped record circa 1968 with no EAR? This is the stuff you need to know about, you should have asked about the EAR in the dead wax, don't pay top dollar for it unless they say it there, or offer photographic evidence. Basically these are just fake NY USA copies. If you don't know any better you might pay a premium for that fake NY USA instead of a fraction for it. Some people don't mind though, just as long as that label reads NY USA. Understand this though, without that cursive p, it's not an authentic NY USA Pressing. Honestly, try as I might, sometimes I can't tell any difference in the pressings sound wise... but you should get what you pay for, it's up to you to know what to look for. I just want to hear good quality music without too much snap crackle pop, but if you're selling and or buying, you want to know this stuff. Hopefully my journey as a collector can help you learn enough of the basics to make sure you're armed with the knowledge to make informed decisions as a buyer and seller. Remember: It's buyer beware out there, you have to accept the responsibility to know what to watch out for. *Photos are my own. * or used with permission via Amazon.com.